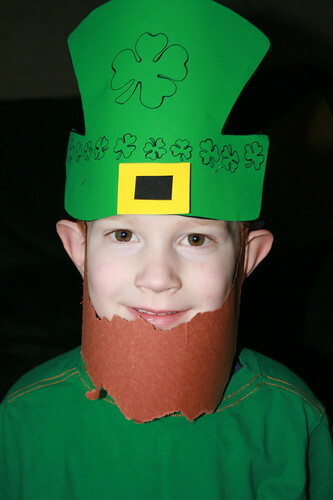 Happy St. Patrick's Day to everyone from our own little leprechaun. We didn't do too much to celebrate the day. Meg reluctantly allowed me to put a shamrock print ribbon on her ponytail this morning. She had a fieldtrip and had to wear her school shirt which doesn't have green. Mattey chose to wear a sparkly green (Christmas) dress. Kade had a party at school. We all played outside for a while at Mat's school during a showing in which the people were a no show. (None of the playground pictures turned out the way I wanted them too.) We didn't even eat any green foods like last year. We had breakfast foods instead. I was going to make shamrock rice krispie treats but never found the time to do it. Guess my new shamrock cookie cutter will have to wait until next year. The picture I should have taken today was of Mickey hanging out the window cleaning the outside. Maybe I can get him to re-enact it tomorrow. I had asked him to help me clean the outside of the window behind the screen on the big window. Somehow that turned into cleaning all the windows. Good thing we don't have that many. ND should sign him up as their mascot for the 2023-2024 season. What a great looking leprechaun!